If you think you have to sacrifice natural skincare for effective anti-aging ingredients, think again! You can find powerful organic ingredients like retinol, antioxidants, soy, and AHAs that are natural and effective. These ingredients help moisturize and firm the skin, soften fine lines, reduce discoloration, and improve your skin’s ability to fight off environmental stresses that age the skin. 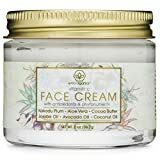 To find the best organic anti aging cream we looked at each product’s active anti-aging ingredients, certifications like organic, vegan, and cruelty-free, and which products had the most users and the highest ratings. Here are the 7 best organic anti aging cream options for you to try! 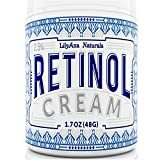 LilyAna Naturals Retinol Cream Moisturizer combines a 2.5% concentration of retinol, a powerful and well-studied anti-aging ingredient, with plenty of moisturizing and conditioning ingredients like hyaluronic acid, shea butter, aloe and green tea extract. A common issue with retinol is that it can cause skin irritation. The conditioning and moisturizing ingredients help prevent that and keep skin plump and moisturized. The cream is rich and moisturizing and doesn’t cause irritation like some other retinol products. You can start using retinol in your 20s to help prevent blemishes and get a jump-start on anti-aging. Retinol is also great in your 30s, 40s, 50s, and 60s for men and women to keep skin looking healthy, young and fresh. Children should not use retinol products. Start by using once a day at night on clean, dry skin to get your skin used to retinol. You can work up to twice a day. Retinol may make your skin more sensitive to the sun, so daily sunscreen is a must. Using twice a day this bottle will last about 2 months. This Vitamin C Face & Eye Cream from Era Organics is one of the best organic anti aging cream options because of it’s brightening Vitamin C and a thick, creamy texture. 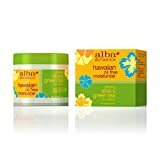 This product is gentle enough to use on sensitive skin and the rich texture is ultra-moisturizing. As skin ages, it can become dull because our cells don’t turn over as fast. Vitamin C helps the skin stay supple, fresh and bright by supporting cell turnover. It’s great if you have age spots or discoloration. Avocado, jojoba, and coconut oils provide loads of moisture with healthy skin benefits. This cream does double-duty as an eye cream, too! Men and women of any age can use this product. If you have acne spot test this before using it all over because Vitamin C can trigger breakouts for some people. Use a small dime-sized amount of product on clean, dry skin. This is a very rich cream so a little goes a long way! You can use this product twice a day. One jar will last about 90 days. Many anti-aging products are heavy and thick. This oil-free moisturizer is silky and light and still delivers hydration and conditions the skin. Hyaluronic acid improves the skin’s ability to retain moisture, which gives a more youthful appearance. Aloe and cucumber provide soothing moisture. Green tea contains antioxidants which help protect the skin from damage caused by the environment. Men and women at any age can use this product. This moisturizer is safe to use on sensitive skin. People with very dry skin may need something heavier, but normal and oily skin types will get plenty of moisture from this product. Use this product after cleansing the skin and layer over any serums or treatments. You can use this morning and night. This product uses Manuka Honey which has anti-oxidant, antibacterial, and anti-inflammatory properties. Manuka honey is an effective deep moisturizer, which is important to keep aging skin looking and feeling soft. For people with skin conditions such as eczema or rosacea, Manuka Honey can be effective at soothing the skin and reducing irritation. 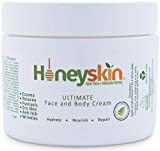 This ranks as one of the best organic anti aging cream because the moisturizer also contains blue-green algae which can boost collagen in the skin. This is safe for sensitive skin and can be used by women, men, and teens. This product is also safe for children. Apply directly to clean, dry skin. This product is safe to use around the eyes and on other areas of the body. 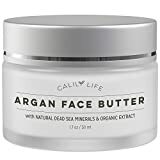 Calily Life Organic Argan Face Cream with Dead Sea Minerals uses two main ingredients – organ oil and Dead Sea minerals – to provide conditioning and anti-aging benefits. Argan oil contains vitamin E as well as fatty acids which soften the skin and can reduce the appearance of lines. If you’re allergic to vitamin E you should not use this product. Dead Sea minerals contain magnesium, sodium, and potassium which improve the skins ability to hold in moisture. Since aging skin can be dry and dryness can accentuate wrinkles, this softens fine lines and helps to prevent dullness. This product can be used by men and women with all skin types. It is rich enough for those with very dry skin, but will not be greasy or cause breakouts for people with more oily skin. Use a dime size amount and massage into skin after cleansing and applying any treatment serums. The manufacturer recommends using this product in conjunction with a vitamin C serum for best results. This cream combines essential oils and powerful moisturizing ingredients including vitamin E, shea butter, and jojoba oil. The moisturizing ingredients help soften and condition the skin and contain antioxidants which protect against environmental stress. When you’re looking for the best organic anti aging cream, essential oils can be very effective. In this product 4 essential oils – Lavender, Bergamot, Chamomile, and Clary Sage – are effective at calming irritated skin, improving skin luminosity, and preventing blemishes. These oils may cause the skin to be more sensitive to UV light, so be sure to wear sunscreen during the day. This may be used by men, women, and teens on the face and neck. Pump a pea-sized amount of product into the hands and massage into clean, dry skin using circular motions. Use night and day. 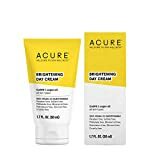 Acure Brilliantly Brightening Day Cream is one of the best organic anti aging cream products because it contains CoQ10 and argan oil. CoQ10 is an enzyme which helps your skin produce collagen and elastin which keeps it looking supple. Argan oil is moisturizing and has fatty acids to soften lines. This product also contains an ingredient called Gotu Kola. Gotu Kola boosts collagen production in the skin. This product is creamy but not greasy and absorbs easily into the skin. 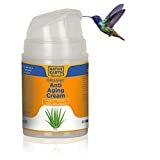 Brilliantly Brightening Day Cream can be used by men, women, and teens as a facial moisturizer. Cleanse and dry the skin, then apply Brilliantly Brightening Day Cream to the face. You can use this in the morning as a day cream. People with normal to oily skin may also use this as a night cream as well. There are plenty of effective, safe, organic solutions for anti-aging skin care. From superfood ingredients like coconut oil to tried and true anti-aging compounds like retinol, these products prove you don’t have to sacrifice organic, cruelty-free ingredients to get results. What do you think is the best organic anti aging cream? Share your favorites in the comments below.